Prospective engineers are not exempted from the challenges facing their peers in higher education and those struggling in the labour market. “The substandard quality of mathematics and science education in high school means that a significant number of engineering students will not complete their university qualification due to high academic demands, and those that earn their degree will have further challenges to overcome that extend beyond graduation day”, said Manglin Pillay, CEO of the South African Institution of Civil Engineering. “Industry confidence in the standard of education and the competency of South African graduates is at a low and local graduates are at the bottom of the pecking order in favour of Chinese and Indian trained engineers,” he said. Pillay was speaking to senior engineering students along with other engineering professional body leaders at Wits, lined-up as guest speakers at the launch of the PPS Inner Circle Lounge. Pillay, whose mandate as a representative of civil engineering professionals often led him to interactions with influential role players, said that he often encounters negative perceptions about engineers-in-training. Leaders describe them as “unresponsive, incompetent, ineffective and unemployable,” said Pillay. He, as an intermediary with the interest of new and old engineers at heart, challenged the students to prove the naysayers wrong. He urged the students to be “technically astute and technically competent with the world, time conscious and creative”. To get a foot in the door and building a satisfying career, he said that students need to be mindful that today’s companies are global enterprises and therefore hire the best in the global market. As a graduate of the Wits University himself, Pillay expressed full confidence in the capacity and quality of Wits graduates. “I know that this University has prepared you for watershed moments and for discomfort and controversy and you will prove that you were born for this”. Other guest speakers included Mike Jackson (CEO of PPS); Vaughan Rimbault (CEO of the South African Institute of Mechanical Engineering) and André Hoffmann (Senior Vice-President of the South African Institute of Electrical Engineers). Speaker presentations shared the advantages of aligning oneself with a professional body and the associated benefits. “The sooner you align yourself with a professional association after graduation the sooner you kick-start your career. The longer you leave it, the more you will have to play catch-up with everyone else,” said Rimbault. This is particularly true in an environment where graduates are finding it difficult to acquire professional experience and mentorship crucial for career development. Advice dispensed on the night by experienced engineers extended to individual brand development, financial management and financial products. Student marketing specialists, Student Village recently released the SA Student Spending Report 2013 which revealed key insight about the spending habits of students in higher education. Rimbault advised students and guests to apply common sense and a bit of mathematics when choosing financial services such as insurance. He lauded PPS products and said they made sense because the “restricted membership to professionals ensured that they had the best pool which has a low risk profile in comparison to the rest and this affected the rewards to members. 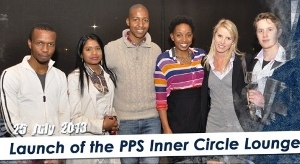 The PPS Inner Circle Lounge will be open to qualifying PPS student members in their 4th year of study and above. It offers students a meeting room, access to the internet, WIFI, coffee as well as a range of professional publications. PPS will also regularly arrange for guest speakers from various professional associations and other relevant persons of influence to speak to the students about their career plans. Visit the lounge at the Matrix, 1st Floor, East Campus.